Welcome to the EFC Scholarship Program. Please enter your email address and password to log in. If you are a new user, please register. / Bienvenue au programme de bourses d'études ÉFC. Pour ouvrir une session, veuillez entrer votre adresse de courriel et votre mot de passe. Si vous êtes un nouvel utilisateur, veuillez vous inscrire. Application Deadline: Midnight, May 31st, 2019. Electro-Federation Canada (EFC) and its members are proud to support the next generation of leaders who will power a changing world in the Canadian Electrical industry. This industry is made up of inventors, creators and visionaries who are creating new approaches to how electrical products are used by Canadians at home, work and play. 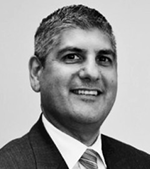 View this video to learn more about the industry. Explore the many scholarship opportunities available through this program and apply for your future today! View all available scholarships. Scholarship recipients will be announced in Fall 2019. 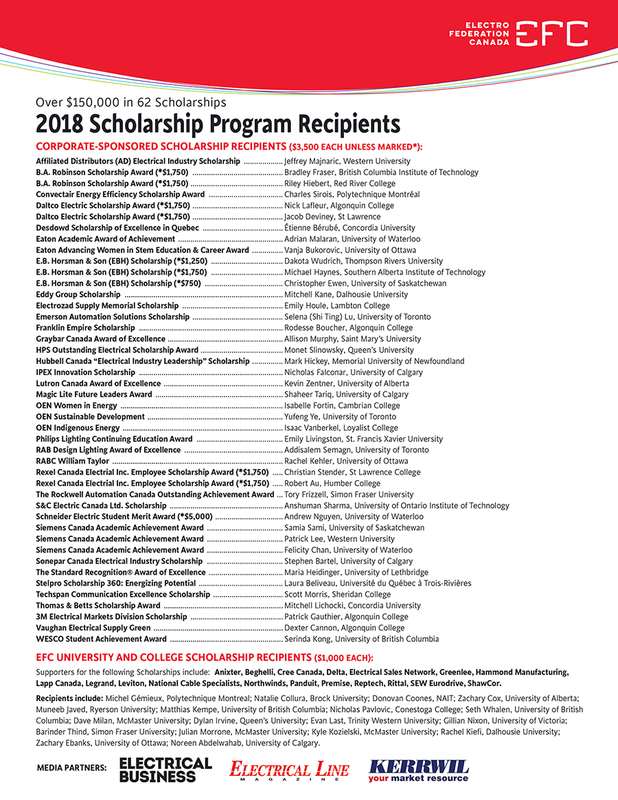 For all scholarships, preference will be given to those applicants with a connection to an EFC member company (http://www.electrofed.com/members/) and who are pursuing post-secondary education in a discipline which targets a career in the Electrical industry, such as Electrical Engineering, Electrical Technologist, Electrical Technician, Industrial Distribution, Sales, Marketing, Finance, Human Resources, Management Operations, Logistics and Information Technology. 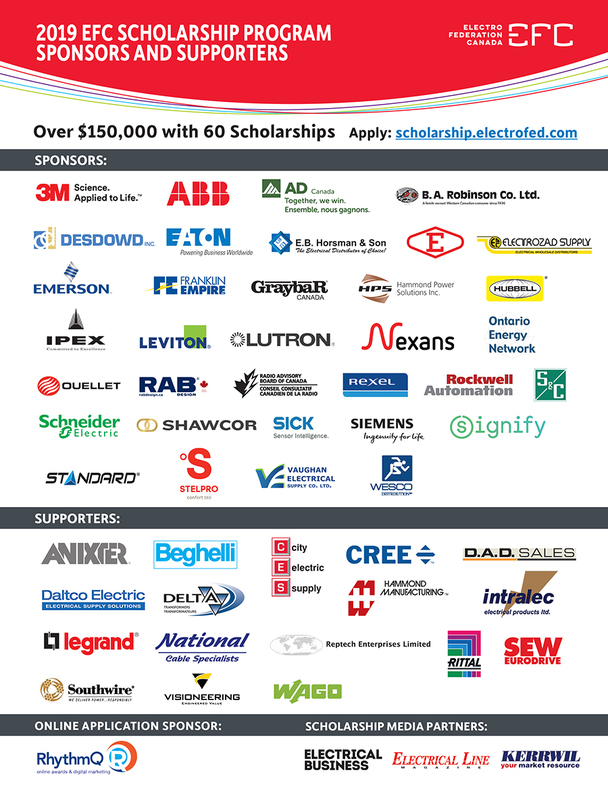 The Electro Federation of Canada (EFC) Scholarship Program is making an impact in our Electrical industry by creating value for Canadian students and EFC membership companies. Since 1995, EFC members have ‘joined hands’ to create value and opportunity for Canadian students by taking their stories to universities, colleges, and vocational education centers across Canada. Utilizing the Canadian Scholarship student database, the program provides viable career choice for students and builds awareness of the great opportunities our industry offers. The EFC Scholarship program provides financial support to Canadian students by increasing awareness of career opportunities in Engineering, Sales, Marketing, Finance, Management, Operations, Information Technology and Human Resources. Students are encouraged to explore all scholarship opportunities and apply at https://scholarship.electrofed.com/Default.asp. On behalf the EFC Scholarship committee, I am pleased to announce in 2019 we will be offering over $150,000 in funding. View the list of last years' recipients. The participating companies listed are leading manufacturers, distributors, agency-representatives, and associations within the industry, offering a vast array of dynamic career opportunities at all levels of their organizations. Our EFC members are engaging with the scholarship recipients by meeting with them and educating them on both their company and the electrical industry. In some cases, scholarship recipients are offered employment. Thank you to all the EFC committee members who dedicated their time and effort to achieve the program goals and thank you to all participating members who have made this initiative possible for over 24 years now. We look forward to sharing the 2019 scholarship recipients this coming fall. Login to the EFC Scholarship System with your email and password.